Ibiza is to my adulthood as Disneyland was to my childhood: There’s no happier place on earth. So in honour of my favourite island ending yet another season, here’s a little peek at it from my perspective. From the second I step off the plane every molecule inside of me takes on an indescribable relaxed excitement. It could be the chilled out beats that seem to play everywhere in the background like a sound track, or the Mediterranean island breeze that’s warm and fresh and constant. Either way: happiness. Although the island could lend itself to a couple’s getaway, I really recommend this for a group of friends. 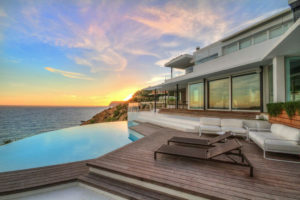 There are incredible villas to rent that will blow your mind with their views, infinity pools, minimalistic spaciousness, and open air living rooms. Hiring a hotel in town will be nearly the same price per person, and not even remotely close to the luxury. My recommendation is staying in San Jose to capture the afternoon and evening sun (you won’t be sleeping much! ), and the stunning sunsets. 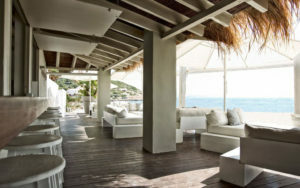 San Jose houses many of the daytime beach clubs and is just west of Ibiza Town, where you can wander through the old town and most of the nightlife takes place. This will do, yes, this will do. Yes, of course, Ibiza is known for its nightlife. No matter what your entertainment taste, I always tell friends to head out on the town one night and then spend the next enjoying your beautiful villa with friends and a meal prepared by a private chef. Sounds swanky, right? Truth be told, you’ll all spend a lot less splitting a 500 EUR fee for the evening, plus the cost of groceries. You can chill while drinking some of Spain’s beautiful wines poolside, and recharge for another day. Back to the nightlife. Woop! Woop! Ibiza, like everywhere in Spain, has a different clock than most of the world. (I credit the siestas.) Dinner reservations are never before 9:30pm, and don’t dare to enter a club before midnight. 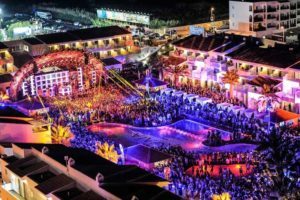 I love Ushuaia in all of its outdoor, large-scale glory, and leading house DJs. Then there’s Pasha – my personal favourite when it comes to music and entertainment. The crowd can be a lot more of the “models and bottles” type, but even in the most laid back places on the island there’s that undertone. If you’re looking to get into the EDM scene, Amnesia is the real deal – and you might catch Paris Hilton in her DJ career. *eye roll* Being down on the main level here is a bit of a liability. I suggest tethering yourself to your friends if this is your plan, but I’d recommend taking a table upstairs and watching the mayhem where you can actually breathe. That brings me to DC-10. This is not for the faint of heart. Room upon room, leading to outdoor areas with many stages, and a crowd that starts turning up at 4am. I’m sure you get the idea. I’ve only been once with a group of my guy friends. They hired me a security guard for the evening, which en route to the club I thought was ridiculous – I can take care of myself! But, an hour in I was thankful for the Polish bloke attached to my hip as I was bumped from show to show, if for no other reason than cutting me to the front of the fifty person bathroom queue. Absolute mayhem. My favourite spot on the island is a lunch club called El Churinguito. 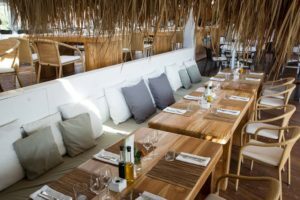 Food and wine are fresh and delicious, and you’ll find yourself sitting on the beach feeling very relaxed. It’s a must. Your driest rosé on ice, please. Twist my arm – I’ll take another! If you haven’t been here, move this to the top of your list for next summer. You can’t possibly be in a bad mood while Ibiza’ing.